Trying to keep your confidence from being affected when losing your hair is difficult and frustrating. We live in a society where people are influenced about what others think or might think about them. Therefore, we do our best to appear in a good light to others. But how can you keep the balance when you start losing your hair and bald spots create an unpleasant appearance? The answer is: you conceal them with hair fibers. This article is a review on the XFusion Keratin Hair Fibers Concealer, a product that came in number 6 on our top 6 hair fibers concealers of 2017. XFusion is the salon-exclusive brand owned by Toppik and can be bought from resellers authorised by the company, no matter if we talk about salons or Amazon sellers. Stylists become XFusion resellers in order to regain their clients’ confidence. As the name says, the XFusion Keratin Hair Fibers are made from all-natural keratin protein derived from a natural wool source that is nearly identical to human hair. The fibers intertwine with existing hair because of the innate charge they hold. XFusion hair fibers are undetectable from up close and offer a completely natural look to men and women suffering from hair loss. They instantly fill and conceal thinning areas, make fine hair look full and thick, and cover roots between colorings. The XFusion Keratin Fibers offer long-lasting results in all conditions (they resist wind, rain, sweat) and work for all hair types and textures including Caucasian hair, Asian hair and African-American hair. The product also works for part lines and conceals extension tracks. Since the brand is owned by Toppik, you can expect similar results and ingredients. Xfusion is available in 9 different shades (black, dark brown, medium brown, light brown, medium blonde, light blonde, auburn, gray, white). The concealer offers 3 bottle sizes: travel size (3g), regular (15g) and economy (28g). 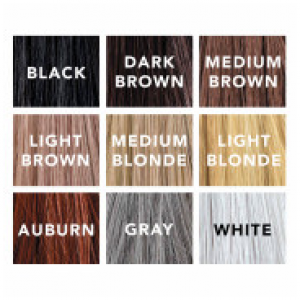 Customers are encouraged to mix different shades in order to find the closest match to their hair, especially for blonde and gray hair. XFusion fibers will last until you wash them away with regular shampoo and you can use your usual styling products only before applying the hair fibers. The frequency of usage, the amount of product used each time and the size of the recipient will determine how long one XFusion bottle will last you. In general, the travel size bottle (3g) will last approximately 7 days, the regular size (15g) will last approximately 30 days and the economy size (28g) will last approximately 60 days. XFusion is safe to use and comes with a range of accessories and tools to nourish and cleanse your hair, but also to provide precision when applying the hair fibers or creating a natural hairline. The XFusion hair fibers are made out of organic keratin proteins derived from natural, a reliable source almost identical to the real hair structure. Keratin is basically a protein found in the human body, especially in the hair strains. Therefore, keratin fibers have the ideal natural static charge that makes the fibers instantly stick to your existing hair like tiny little magnets. This action creates density and adds volume. The static charge also helps keeping the fibers in place for a longer period of time. Compared to other fibers of different provenience, keratin fibers create a natural-looking texture, don’t fall off and don’t clump throughout the day. Since fibers need to existing hair, most of the times they are not recommended on completely bald scalps. XFusion Spray Applicator. A patented applicator that allows you to target and spray the Keratin Hair Fibers into specific areas. The Spray Applicator can be used to conceal roots, disguise parts or blend hair extensions and along with the Hairline Optimizer will provide a natural and clean hairline. Applying more or less pressure controls how much product is dispersed. 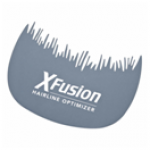 XFusion Hairline Optimizer. The Hairline Optimizer has a unique design to help you obtain the most natural-looking results near the front hairline. With the Optimizer you eliminate any unnatural straight lines and to prevent fibers from falling all over the forehead. XFusion FiberHold Spray. FiberHold Spray is a fine containing alpha-grade resins meant to strengthen the bond between hair fibers and real hair. It’s the perfect finishing step that adds shine and makes the fibers more resistant to rain, wind and perspiration. You must hold the bottle 4-8 inches away from hair and apply short sprays. 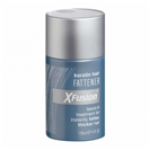 XFusion Hair Fattener. A hair styling serum designed for fine and thin hair and which adds volume, shine and thickness. The product contains a mix of keratin proteins and nutrients making the hair stronger and healthier. The Hair Fattener is free of parabens and sulfates. XFusion Hair Building Shampoo. A thickening shampoo with a lightweight formula that delivers a unique complex of keratin proteins and antioxidants. The shampoo offers fullness and volume, strengthens and repairs thin, thinning and damaged hair. The product doesn’t contain parabens and sulfates. XFusion Hair Building Conditioner. One of XFusion’s best hair-thickening and moisturizing conditioner that fills and adds volume to fine, thin and damaged hair. The conditioner contains a concentration of antioxidants, vitamins and keratin proteins in order to support a healthy hair growth. The conditioner is free of parabens and sulfates. Applying the XFusion Keratin Hair Fibers requires a very simple process. You spray the keratin hair fibers on your hair loss areas using the XFusion Spray Applicator, you conceal areas near the frontline with the XFusion Hairline Optimizer and you finish by applying the XFusion FiberHold Spray to ensure longer-lasting results. The three tools work together with the XFusion Keratin Fibers to provide a flawless and all natural look. Always dry your hair and use styling products before applying the hair fibers to avoid unpleasant effects. Gels, mousses, pastes or serums be used and let to dry before the fibers, otherwise, they may cause shifting and reveal areas that were meant to be concealed. The only styling product that can be used before and after the application is hairspray. XFusion offers various color options in order to mix shades with each other and get the result that best matches your needs. They can be mixed by applying them directly on your hair (the darker shade first) or by mixing them in a Keratin Fibers bottle. For custom color looks you can use black and white (or gray and white) for a salt&pepper look, light blonde and white for platinum blonde and auburn with medium blonde for a strawberry blonde hair. The application tools are not necessary, but offer more control and are less messier. However, XFusion will work instantly even if you just shake the Keratin Hair Fibers over your thinning hair areas. XFusion offers great coverage for thinning hair and receding hairlines, and the fibers stay in place most of the time and if they are not touched. The Keratin Fibers Concealer is a great confidence builder making its users feel a few years younger. The hair fibers are resistant through mild humidity, but they might become noticeable during workout. Most customers use hairspray as an additional step to keep the fibers in place. However, if you scratch your head you will get residue under your nails and if you wear glasses or sunglasses be careful not put them on top of your head to avoid black marks. XFusion is a good concealer and is applied very easy and quick after a few tries. 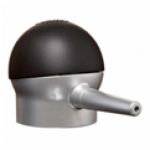 However, its customers can’t seem to cope with the Spray Applicator, random users and professionals alike. The applicator usually clogs after being used a few times, the pump is not efficient because it doesn’t disperse enough fibers and you have to put a lot of pressure, and it sprays uneven dots. Apparently, XFusion has “improved” the old Spray Applicator into something that is of poorer quality. The Hairline Optimizer is also hard to work with and doesn’t help at all. Some Amazon reviewers and long-term customers are suspecting the company has changed the original fiber formula. XFusion is generally a safe product. According to the brand, it can be used with Rogaine, Minoxidil or Propecia without worrying about any unpleasant side effects. However, the customers’ suspicion that the original formula has been changed may be confirmed by some customers claiming they had rashes and irritations the last time they used it. It’s a subjective aspect though. The Keratin Fibers do not encourage or block hair growth and don’t clog your pores even if it is used daily. Make sure you take precaution when using the hair concealer along with other styling products to not cause bad reactions. Better test it on a small area first. The XFusion products are for external use only and you should avoid any contact with the eyes or inhaling the containing. Discontinue use if irritations or rashes appear and keep away from children. The XFusion Keratin Hair Fiber Concealer is a good product for disguising thinning areas and provides a full and thick coverage. It usually is resistant to mild humidity and the keratin fibers stick on your head most of the time. The application process is simple and the effects appear instantly. However, you obtain better results without using the XFusion application tools. The safety of the product is debatable because of some cases in which customers complained about getting scalp irritations. The XFusion products are sold through authorized resellers which you can find on the brand’s official website.